Random thoughts, observations and general blathering. Here’s a story for the Fourth of July. The day after my mother died, my father implored my sister and me to go through her clothing and take some items of hers to keep. I stepped into my parents’ closet and could not believe my mother would never wear those familiar dresses and blouses again. But my difficulty didn’t end there. My mother’s taste in clothing was very different from mine – much more girly – and she was quite a bit larger than I was. I doubted I could wear anything of hers even if I found something suitable. But it seemed to mean a lot to our grief-stricken father, so while my sister watched, I searched through our mother’s clothes. I studied each garment on its hanger and then slid it away, occasionally releasing a faint, heart-squeezing scent of my mother’s perfume. Finally I found something I might actually wear – a simple red sweatshirt. In triumph, I grabbed it from the rack and twirled around to show my sister. Every July 4th – and only on July 4th – I wear a special shirt. 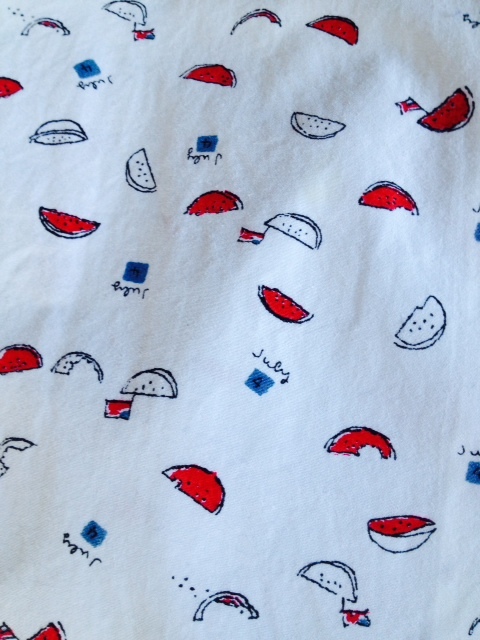 It’s a short-sleeved cotton camp shirt, printed with a whimsical 4th of July design that features flags and watermelons. The shirt did not belong to my mother, but it could have. My patriotism usually takes the form of waving protest signs, tough love to push our country to live up to its ideals. But on July 4th I’ll wave flags – at least the ones printed on my shirt. I’ll wear my one piece of clothing that would have been at home in my mother’s closet. It’s not a bad look, if only once a year.